Great People Me login portal is developed by the Kroger Co for its associates, so that they can access the new and information source meant for them. 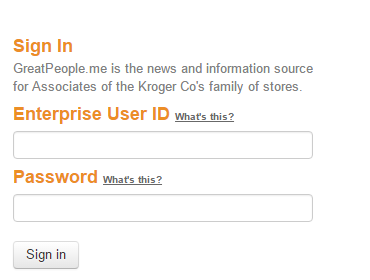 Through the web portal, one can access all their associate information of the Kroger Co’s family stores. Kroger is a leading retailer that provides employment to over 339,000 associates who offer their services in 2,425 stores. Founded in 1883 the retailing chain is headquartered in 1014 Vine Street Cincinnati, Ohio45202 United States. Associates can log into their account through any computer or mobile supported browser. To log in you need to visit the sign in page then provide the credentials. Read below to find a detailed explanation to the Great People Me Login procedure. Step 1– In order to log into your Great People Me account you need to visit the login page. Step 2– Once the web page opens you will find the ‘sign in’ section at the top right. Provide your Enterprise User ID and Password in the white boxes and click “Sign in”. Step 1– Users who have lost their account login password must open the password reset page. Step 2– You can change or reset your password by providing your Enterprise User ID in the white box below. Step 3– Click on “Continue” and you will be allowed to set a new password. You can contact the customer help desk at 1-800-952-8889. Say ‘password’ or press ’20’ when prompted, then stay on the line for support. For the security of your account, you must call from your work location to have a password reset.